With the dark and creative "The X-Factor", MAIDEN showed they can renew without betraying themselves. Despite all this, the fan-base was divided about this orientation, but especially about new singer Blaze Bayley, who couldn't match Bruce Dickinson's high-pitched vocals during concerts on old songs. Therefore the band decided to go back to basics. 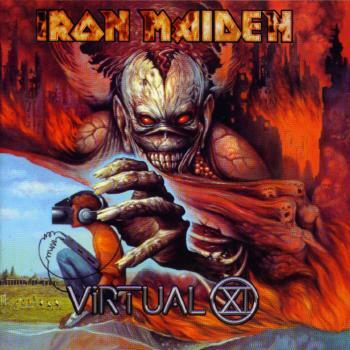 "Virtual XI" abandons the controversial sinister atmosphere and doom incursions of its predecessor for typical IRON MAIDEN stuff. However, although more dynamic and classic, this eleventh studio album presents some major flaws. The first one is obvious. Bayley's low tone was well suited for somber and mid-tempo compositions, like on "The X- Factor", but, as mentioned before, not adapted to epic maidenien tunes. Second, some tracks do clearly not justify their 8-9 minutes duration. This disc contains too much repetitions and offers not enough variety. Finally, and most important, surely wanting to please the fans, the Englishs didn't take many risks on this one. Simplistic and averagely inspired music for an uneven result. Nearly half of the material is good though. "Futureal" is quite pleasant, fast-paced and punchy, typically in the direct lineage of MAIDEN's openers. Beginning with delicate arpeggios, soft and heavy passages, "Lightning Strikes Twice" takes us by surprise with its ferocious riff and main theme. It rocks! Nonetheless, the memorable title from "Virtual XI" is undoubtedly "The Clansman". Inspired by the movie "Braveheart", this epic possesses is a powerful hymn, crafted for and still played at concerts. The tapping at the end is just gorgeous! Freeeedooooooom! "When Two Worlds Collide" is average but has enjoyable moments. And... that's it. The other tracks are boring, too long and definitely repetitive. No memorable tunes, no breathtaking bridges. A good example is the longest track of the record, "The Angel And The Gambler", which does certainly not deserve its 10 minutes duration. A little originality is "Como Estais Amigos", soft and melancholic, but not really Spanish sounding and a bit deceiving. As a return to the original recipe, "Virtual XI" is an half-failure. There are a few interesting tracks, more suited for the vocal range of Dickinson, however the rest is flavorless, basic, lengthy and not varied enough. Not too bad, not the worst MAIDEN album of the 90's, just unequal. So if you don't know this disc, do not skip it. This eleventh opus will be the second and last recorded with Blaze Bayley. The band asked him to leave, and historical singer and guitarist Bruce Dickinson and Adrian Smith will come back. But was it worth it?